Today's Notices and Proceedings Report, published by the East of England Traffic Commissioner, contains only one entry of interest relating to our local area. Woodbridge-based Paul Frost has registered a Snape to Woodbridge service under short notice which is scheduled to commence from 3rd July 2017. 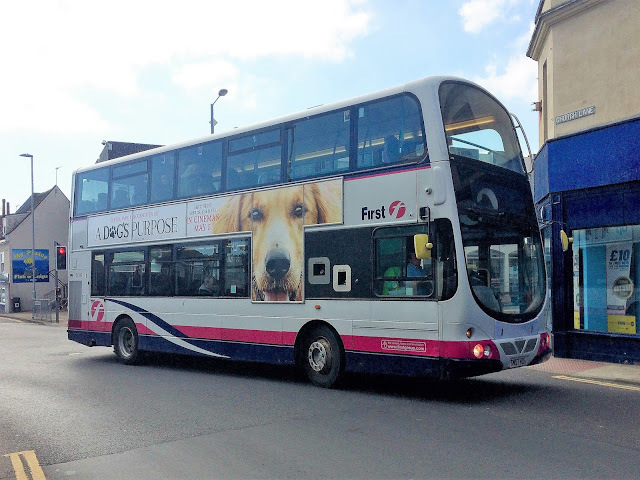 The Monday to Friday 62 route also serves Wickham Market, Framlingham and Saxmundham. Still sounds wrong to say that 2007 is ten years ago! Anyway back then i was working in Yarmouth and my walk home from work meant i could catch all the latest visitors to frequent the coach park. A selection of photos from June & July that year. First up we have Shearings Volvo/Jonckheere 524 MX03AEA, A merger between Shearings and Wallace Arnold saw vehicles wearing a new livery at the time, Blue was the standard colour with Grand Touring coaches in a Gold colour scheme. National Holidays are still regular visitors to Yarmouth and above we see former Wallace Arnold Plaxton Paragon 973 Y733HWT wearing the all white livery. A local visitor on this day in July 07 was Whincop of Peasenhall's Van Hool 9591PW Which was minus any lettering at the time. Next up is the rather impressive Neoplan Skyliner JBT3S of Johnson Brothers from Hodthorpe in Lincolnshire, again still regular visitors with their impressive array of vehicles. 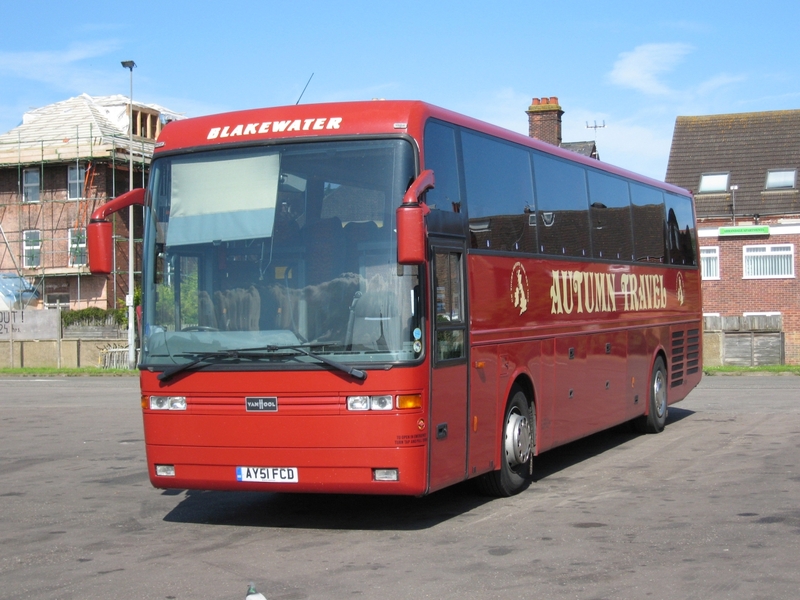 Final picture is this Van Hool of Autumn Travel, AY51FCD i believe was new to Chambers of Bures in Suffolk, of course they are now part of the Go Ahead group. There were a few notable visitors including this Crawley Luxury Coaches Setra 789CLC - almost all of the fleet feature CLC in their registrations This one is of January 2003 vintage being new to Clarke of Lower Sydenham as LW52AKN. 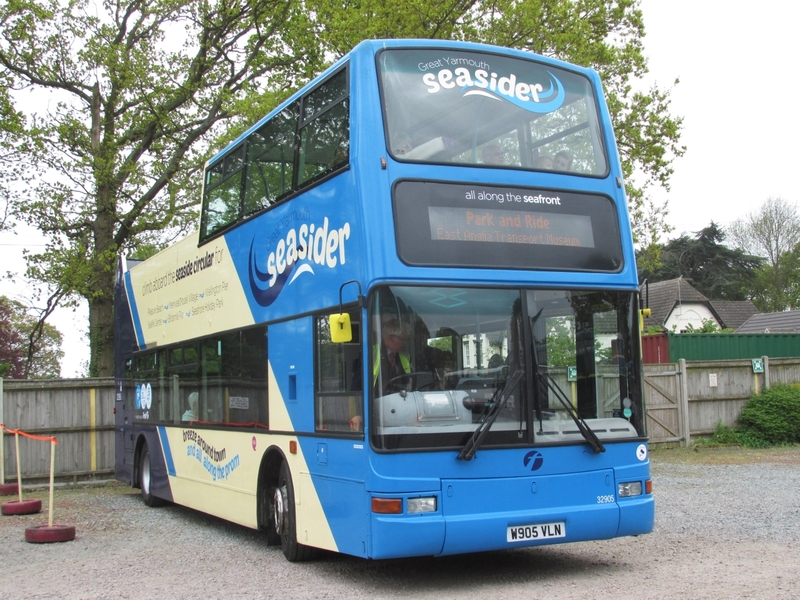 The Crawley-based operator acquired it from Bluebird of Weymouth in May 2014. A member of the York Pullman fleet was also in attendance in the form of 777OWX. Wearing fleet number 379, it's a DAF powered Van Hool Alicron T915 integral coach which was new to Gain Travel of Wibsey in 2008 registered as YJ08EEX. 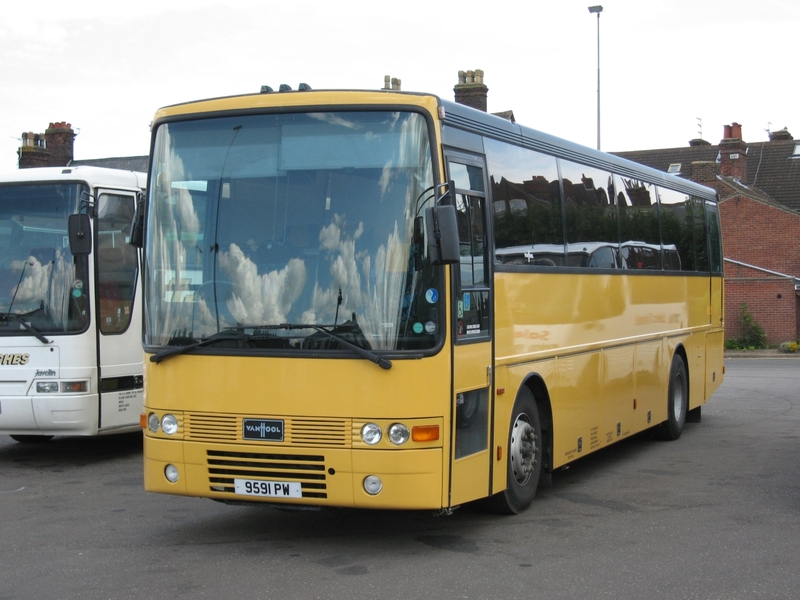 Hiding in the rear rank was Alfa Travel's Mercedes Benz Tourismo BX15OED - numbered 92 in the company's fleet. 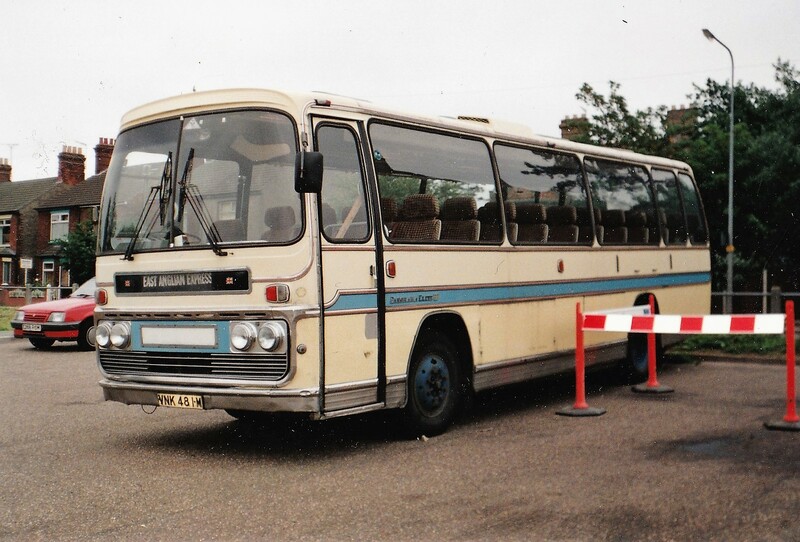 This week's Throw Back Thursday subject is a Plaxton Panorama Elite bodied Bedford YRQ believed to have been operated by Belle Coaches. VNK481M was a regular performer on the Beccles to Great Yarmouth run and I remember the driver very well as being a tall thin gentleman with a husky voice. It was also used on the return service during the evening rush hour using the same driver. As I became a regular user of the service we became good friends. All the information I can find about the coach is that it was new to Pavlou of London N8 in May 1974. (Thanks for the correction Harnser!) This places it in the Hornsey and Harringay area. The London operator also had similar VNK482M. Unfortunately no other trace of it can be found so if any of you can provide additional information I would be very grateful. A fortnight ago I reported that Beccles based Border Bus had taken delivery of a former London Transport decker for fuel evaluation purposes. I have tried, unsuccessfully, to capture a photo of Scania OmniCity LX59CNA on 580 duty in the Great Yarmouth area. However, Simon Bartram has had a bit more luck than I have, as he got a photo of the former Stagecoach London bus outside the old BHS Store in Regent Road at lunchtime this afternoon. Many thanks to Simon for the photo. 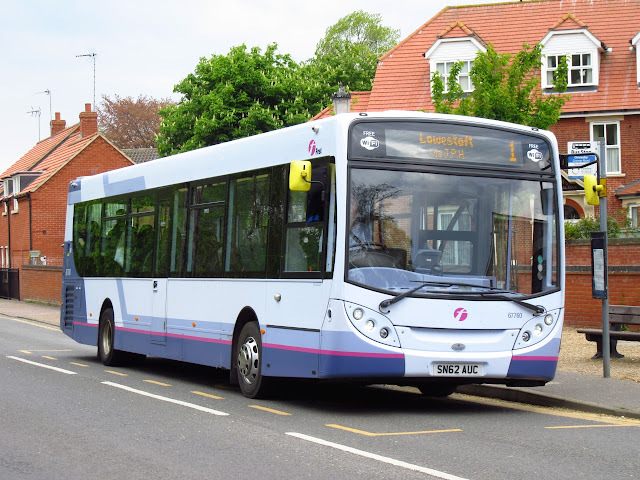 A few changes to local bus services appeared in this morning's Notices and Proceedings Report. National Express is introducing a daily (except Christmas Day) 727 limited stop service between the University of East Anglia and Gatwick Airport via Norwich, Thetford, Newmarket, Cambridge, Stansted Airport and Heathrow Airport From 17th July 2017. So it seems the 727 service is continuing! 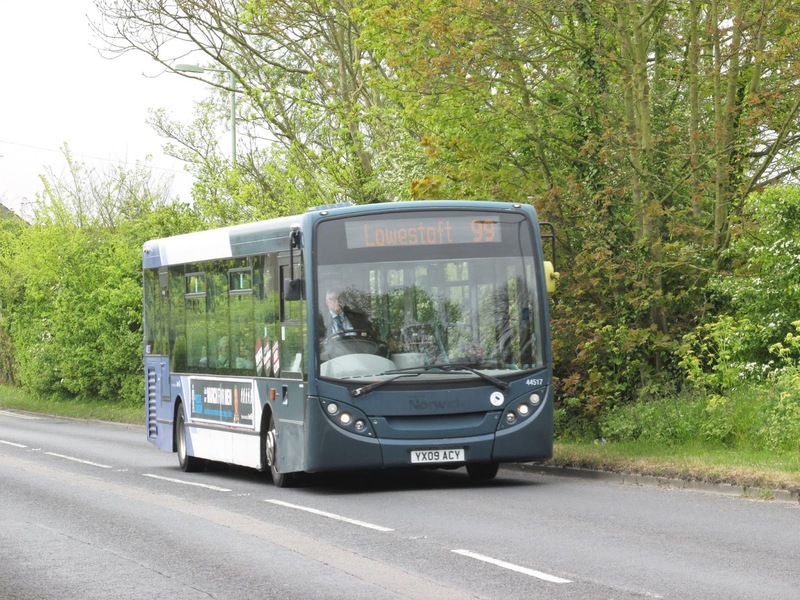 Anglianbus is to vary the route, stopping places and timetable of its 61/61A/61B/61C service between Bungay and Lowestoft from 8th July 2017. 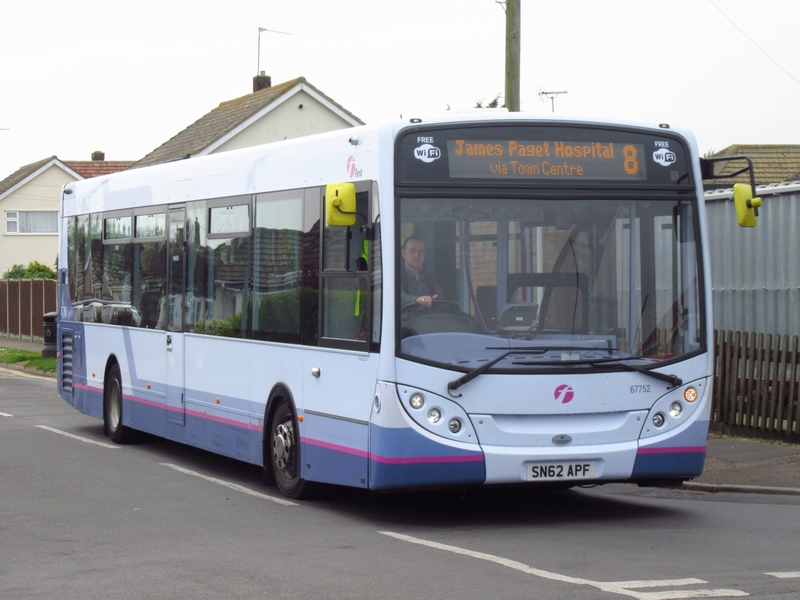 Under short notice, First Eastern Counties is to amend the route, stopping places and timetable of its 70/70A service between Old Cattle Market, Ipswich and the Turban Centre in Woodbridge from 2nd July 2017. After my 'taxi' run this morning I continued to Great Yarmouth to see what was about on the seafront and at Beach Coach Station. Marine Parade, outside the SeaLife Centre, was host to three coaches; the regular National Holidays Mercedes Benz Tourismo NH15LDH plus similar Rambler Coaches UK15RAM and Olympia Travel's Volvo B9R L16WHY. Included in the nonet at Beach Coach Station were two further National Holidays' coaches. They were both Tourismos - NH16FEH and, my first sighting of the operator's 17 registered vehicles, NH17JFH. For those interested, the fourteen 2017 deliveries are registered NH17BFH-HFH/JFH-NFH, PFH and RFH. 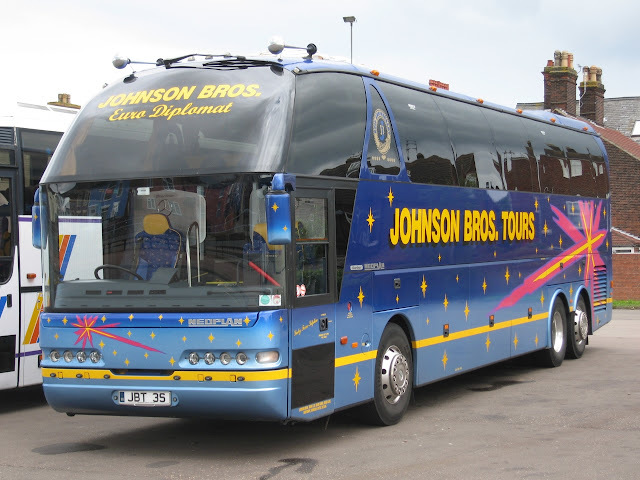 Among the other tourers were Shearings' Setra 516 BU13ZTH and Alfa Travel's Tourismos 88 BX14OMO and 78 BU13ZTY. GeeVee Travel's all white Bova WA54ECX was also present. 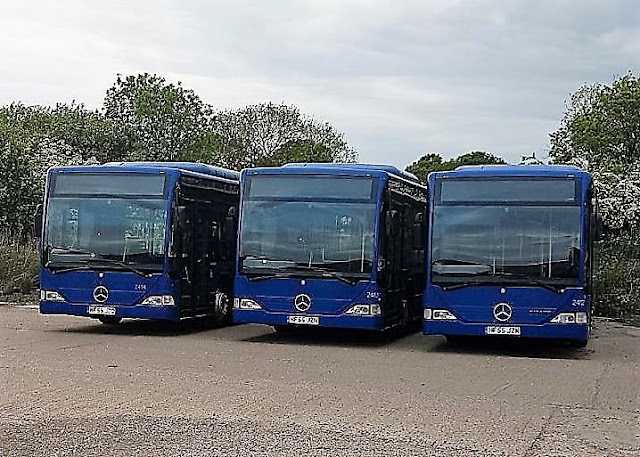 Blue is definitively the colour - following on from the Shearings post of yesterday a couple of photos of Bluestar Mercedes Benz Citaros appear on the blog here today. They are becoming more common on local services and are regularly appearing on Anglian's 61 route between Kessingland and Great Yarmouth via Lowestoft. I was fortunate in seeing a couple of them yesterday at Shearings' base at Corley Services just off the M6 motorway immediately south of Birmingham. I was unaware that this facility existed and was able to observe another four vehicles that were also present. The 2017 registered vehicles noted were 928 BN17JUX and 914 BN17JTY whilst Setras 203 BK10EJD, 228 BF10VCY, 301 BK11GJE and 639 BT63GCZ were also on site. For the record the complete intake is numbered 901-929 and are registered BN17JRU/V/X/Z, JSU/V/X-Z, JUA/C/E/F/H/J/K/O/T-Y respectively. This week's Throw Back Thursday looks at the large influx of Ford Transit and Fright Rover Sherpa minibuses into the Eastern Counties fleet during the mid 1980s. 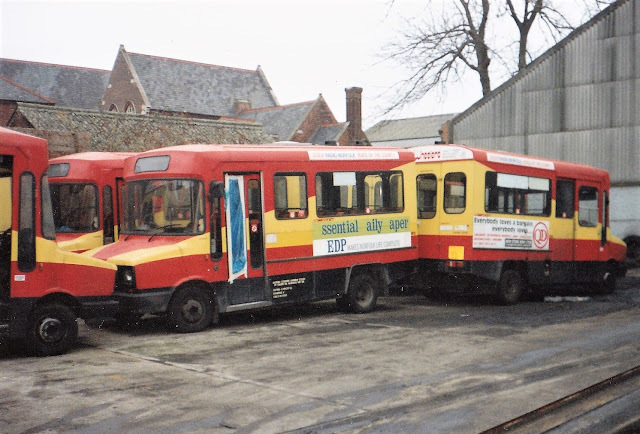 Just about all of them gave less than ten years service and the photos accompanying this post show the 'bread vans' (as they became affectionately known as) awaiting their fate at the rear of Ipswich's Foundation Street depot sometime during 1993. Since the mid 1980s the 16 seat minibuses have been replaced with larger vehicles with frequencies consequently reducing. However, a subsequent culture change means that passengers are now less likely to want to wait for the bus to arrive; expecting an instant service. 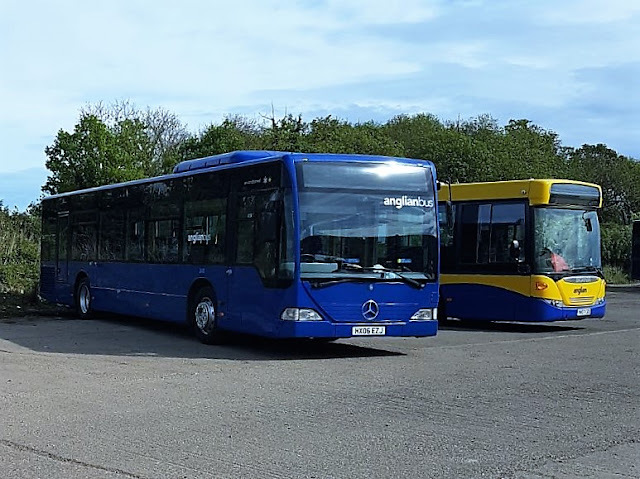 This has been recognised by Stagecoach which is experimenting with the introduction of Mercedes Benz Sprinters on services in Ashford, Kent. No doubt many operators will be monitoring how well the service performs. A few changes to local services to report following today's publication of the Notices and Proceedings Report by the East of England Traffic Commissioner. First Eastern Counties have made a number of applications to vary some services in the area. They include amending the timetable of the 64A/964 service between Aldeburgh and Saxmundham plus the X7 from Ipswich Old Cattle Market to Felixstowe Grange Farm. It is also to alter the route, stopping places and timetable of 75/76/76A/77 and 77A Felixstowe to Ipswich service and similarly the 63/64 between Ipswich Rail Station and Aldeburgh. All changes are to take effect from 2nd July 2017. Paul Frost of Woodbridge is to cancel the operation of the 62 service between Bridge Street in Framlingham and Hamblin Road in Woodbridge from 30th June 2017. Finally Richard Hopkiss and Pamela Hopkiss have received approval to increase its authorisation to six vehicles at its site at Pinelands on Catfield Industrial Estate in Catfield. A quick visit to Great Yarmouth town centre today and there are some observations to report. I firstly looked in at Beach Coach Station which had eleven coaches on site - three of them were from the National Holidays fleet. They were Mercedes_Benz Tourismos NH15ECH and the regular NH15LDH plus Setra NH14HBH. 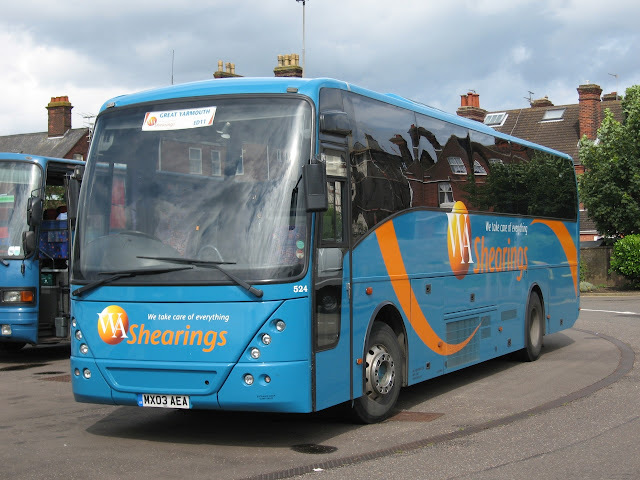 Other short stayers present included Shearings Holidays' Setra 632 BG63VVN plus Alfa Travel's Tourismo 84 BX14LCN. 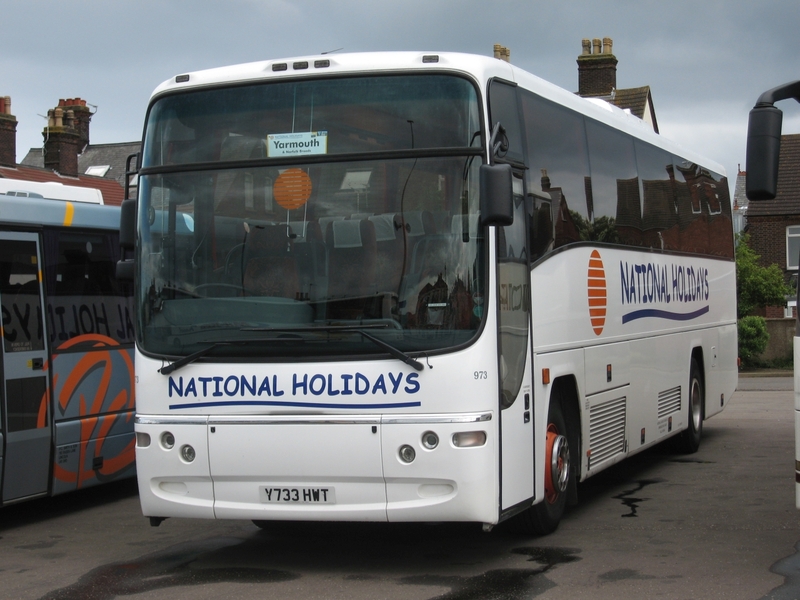 A notable visitor from Ipswich was Angus Coaches' Setra L600ACT with the 'Great Yarmouth Fish & Chip Tour' as it referred to on the front windscreen! Finally, I passed Market Gates where I observed First Eastern Counties open top Dennis Trident/ Plaxton President 32905 W905VLN being gainfully employed on service 2 to the Barrack Estate. Today it was their first appearance on the 61 service connecting Kessingland to Great Yarmouth via Lowestoft. I managed to get a photo of Blustar liveried 2414 HF55JZO in Gorleston High Street working the 11.44 from Great Yarmouth. The front screen received an 'anglianbus' notation prior to entering service. However, the vigorous use of the wipers during this morning's heavy rain seems to have had an effect on it! Go South Coast Bluestar liveried Mercedes-Benz Citaro O530s began arriving at Anglian's Ellough base during yesterday evening. 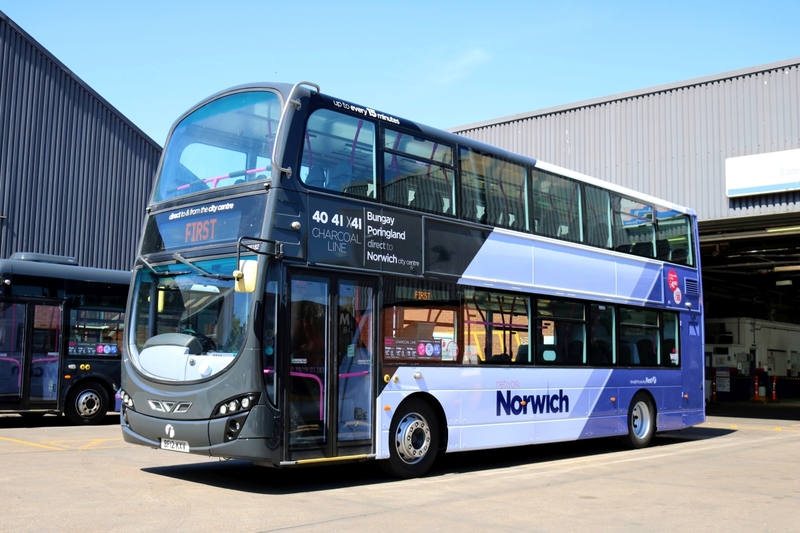 They are at Anglianbus on loan with at least one, HX06EZJ, entering service today having been noted in use at Norwich Bus Station. It is one of thirteen expected to be supplied to the Beccles operator with the remainder expecting to arrive at the rate of about four a day. Already observed at Ellough, in addition to the aforementioned HX06EZJ, are Go South Coast's 2412-4 (HF55JZM-O) with this trio still retaining their fleet numbers. A further two have also arrived on site. Most of them were placed in reserve by Go South Coast from January this year. 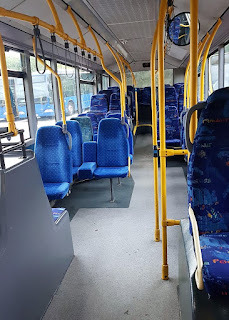 The interiors very much reflect the vehicles' Bluestar branding as the accompanying photo show with the seating primarily blue. The second of the two Volvo B9TL/Wright Geminis recently transferred down from First Borders entered service yesterday, 37141 & 37142 SN57HDA/HDC are both now in use from Caister Road, i managed to catch up with 37142 on its second day in use this evening in Caister On Sea. A trip to Norwich on Saturday and an opportunity to observe activity in the 'Fine City' though little to report really. Our trip into the city centre was on First's Green line StreetLite 63319 SK65PWZ which seemed to have lost its front nearside mirror on its way into the city! It was quickly replaced at Castle Meadow. Another Great Yarmouth regular out in the city was Anglianbus Scania OmniLink 454 YT11LVF which arrived on the 87 service from Poringland - despite being branded for the 61 Great Yarmouth - Lowestoft - Kessingland route! With bus lane works underway at the city's bus station and temporary stops in operation, some National Express services had to use the Surrey Street exit which meant its coaches appearing on St Stephens Street. So far unreported here is the use of the '5 Series' branding by Konectbus for routes providing an improved service to the east of the city along Yarmouth Road. During his lunch break yesterday First driver Roger Bellward looked around Great Yarmouth's Caister Road depot and took some photos of some of the buses present. Loanee Enviro 300's are curently in use around Great Yarmouth with no less than three in use today. 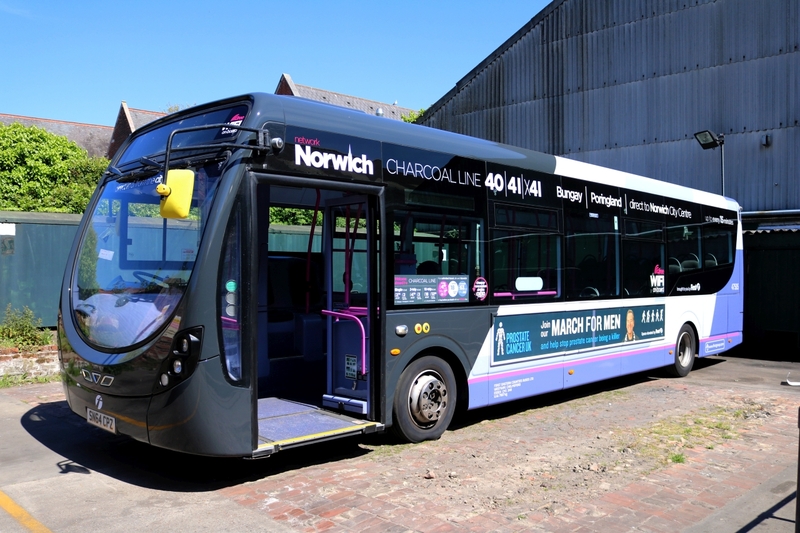 All are expected to head to Ipswich for use on the new Park & Ride service. 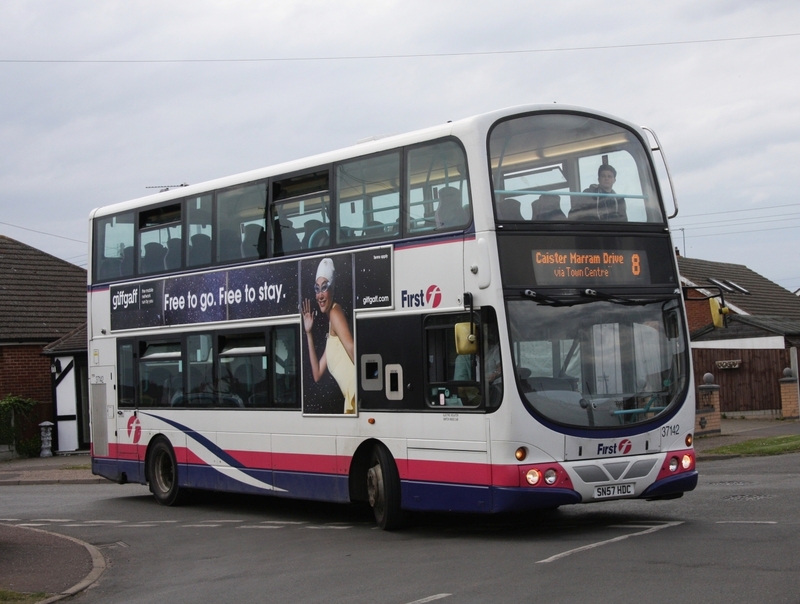 Firstly i managed to photograph 67752 SN62APF working the 8 service in Caister this morning. Next was 67760 SN62AUC which was out on the 1 service and caught up with it at the Royal Oak in Ormesby at Lunchtime. 67763 was also in use but did not get in front of the cameras! 67760 with a new look Will Drake at the wheel! Finally Cameron Robinson caught sight of former Norwich Enviro 200 44517 YX09ACY working the 99 service in Lowestoft, It has been stood down from use on the Charcoal line in the city to be replaced by the ex Yarmouth Streetlites. Finally a non enviro vehicle but just a note to say Open Topper 32905 W905VLN has been in use on Park & Ride duties over at the Transport Museum at Carlton Colville for its 1940's weekend. Thanks Again to Cameron for his Photos. Grahame. 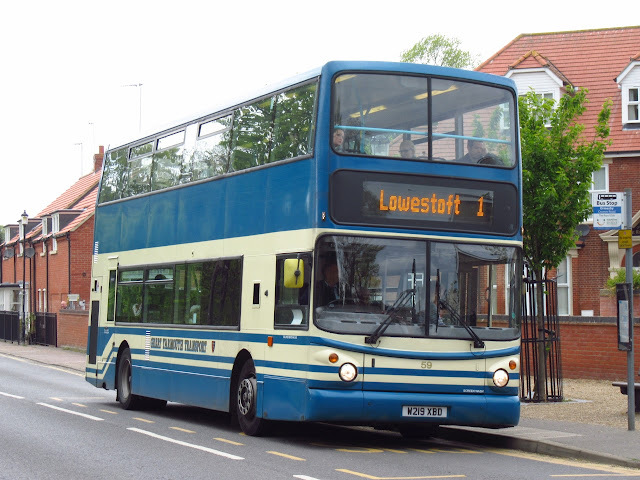 Today saw both of First's local based Heritage liveried vehicles appear on the Lowestoft - Martham 1 service this morning. Both were captured in action below. Thanks to Cameron for use of his photo. Grahame. 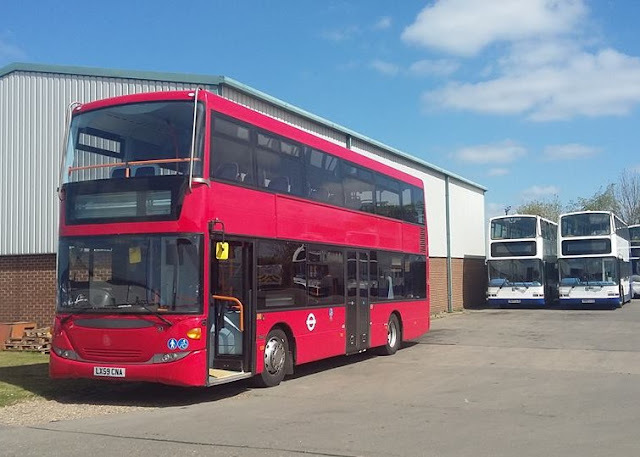 Some of the Anglianbus single deckers are having branding applied for the operator's 61 service. It appears along the roofline of the vehicle providing details of the major stopping points along the route. Grahame first noted Scania Omnilink YT11LVE carrying the branding in late April whilst I managed to get a photo of similar AU61AVK this afternoon. 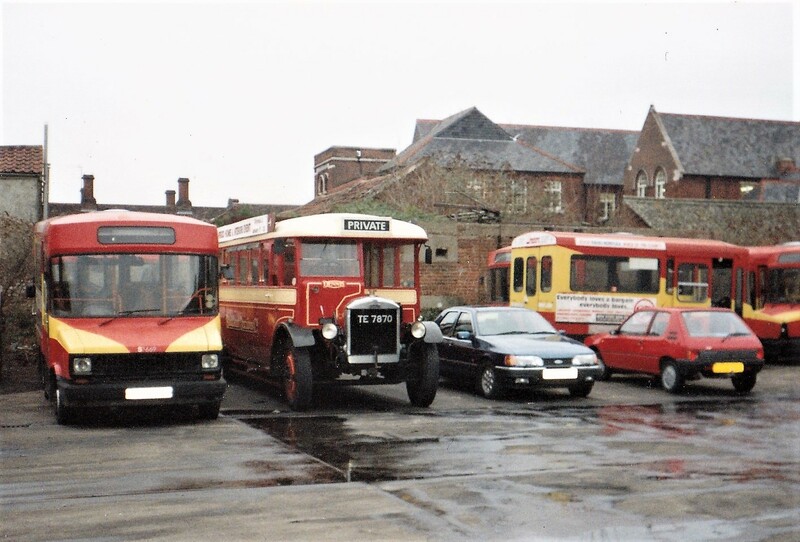 For this week's Throw Back Thursday we travel back in our time machine to 28th January 1995 to Beccles Old Market Bus Station. The photo shows Eastern Counties Eastern Coach Works bodied Bristol VRTSL6G TAH273W. As VR273, it was new to the company in May 1981. It has just arrived on the 171 service from Norwich and the driver appears to be consulting his fares table before issuing a ticket prior to departure to Lowestoft. VR273 met an untimely end in 2000 when colliding with a sugar beet lorry which was reversing out of a lane/field hidden by a hedge. The driver, who was lucky to survive, had to exit the bus via his cab window. A photo of the damage can be viewed by clicking HERE. It was disposed of to Spall of Dallinghoo (near Woodbridge) soon after. 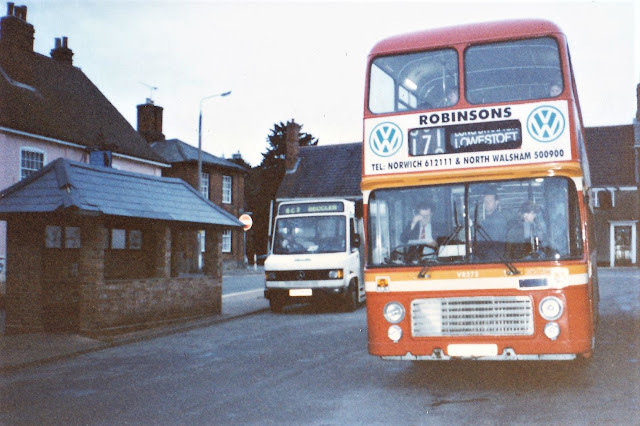 At the adjoining bus stop is Waylands Minibus F122KAO about to work Beccles town service C2 to Banham Road. The Mercedes Benz 609D was new to North Western in July 1989. My apologies for the photo quality as it was taken in fading light plus the standard of photo processing doesn't help either! 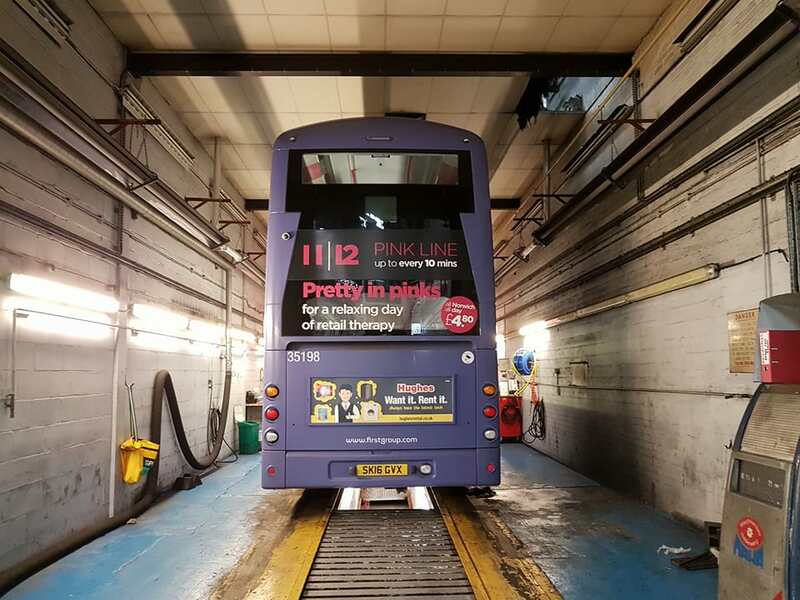 Today saw the finishing touches being added to the four ex Great Yarmouth vehicles bound for Norwich and the new Charcoal line route between the city and Poringland & Bungay. 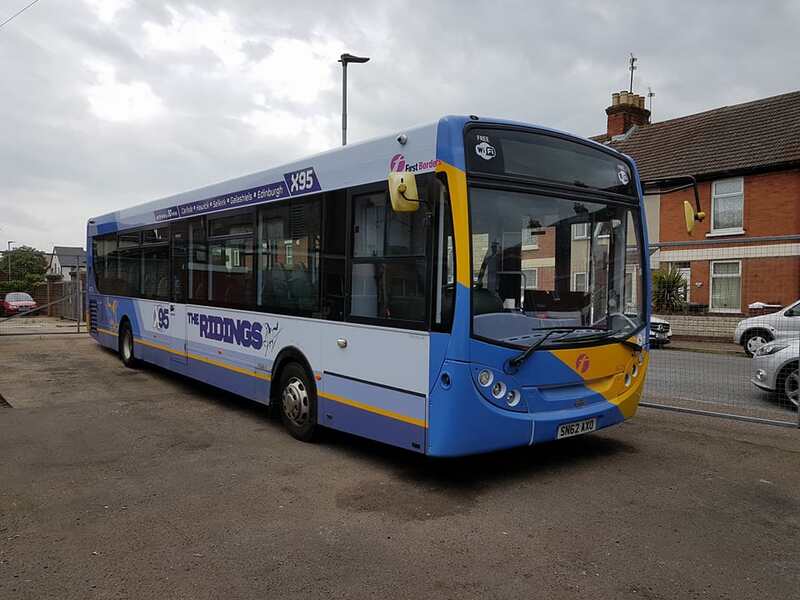 Volvo B9TL Geminis 36181/36182 and Streetlites 47505/47506 have all been repainted at Simon Morris in Ipswich and today saw the finishing touches added and the branding completed. 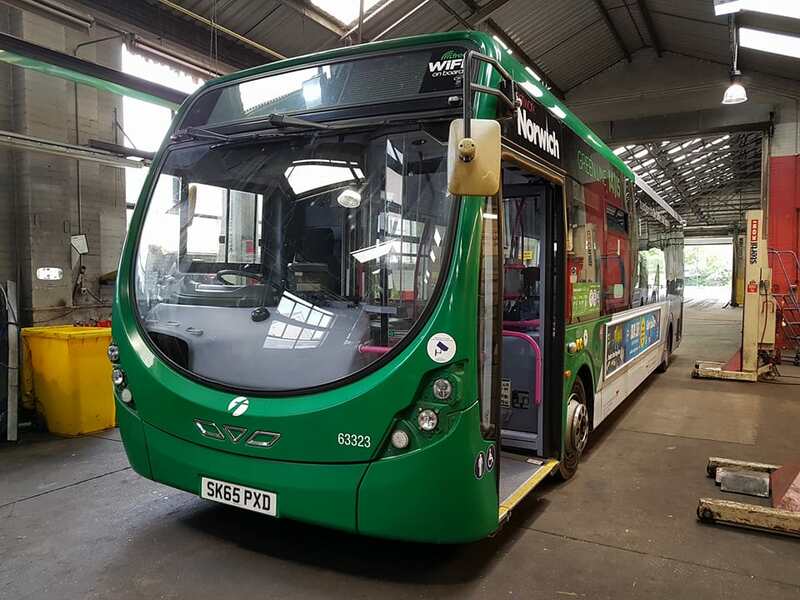 The new vehicles will begin use on the route from Monday 15th, this will see the existing Enviro 200's return to Ipswich. 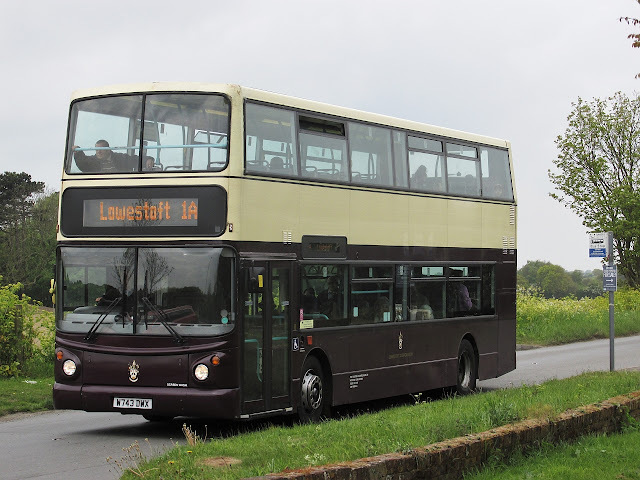 Two Volvo B7RLE are expected to leave Ipswich and move down to Lowestoft, 66850 MX05CHD has already made the move and was noted at work on the 99 service this afternoon minus its Ipswich fleetnames. 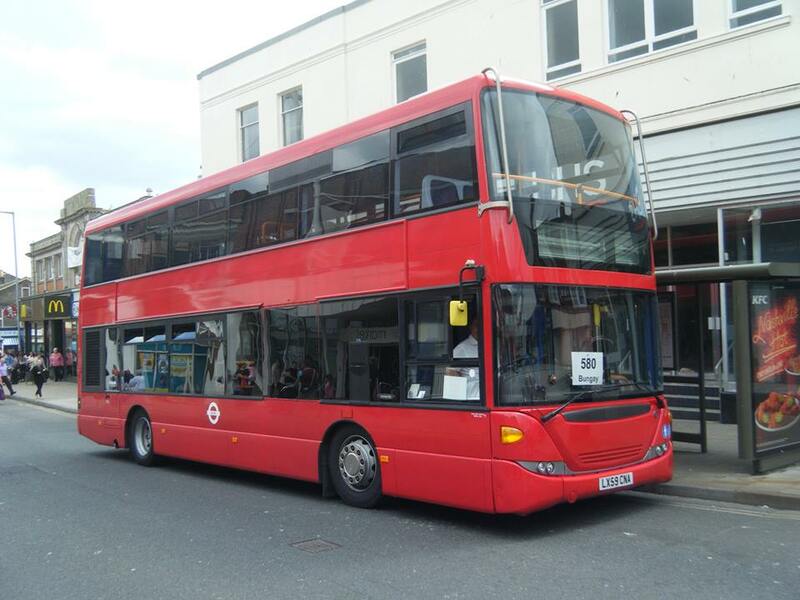 Another arrival noted in Lowestoft today was Enviro 300 67752 SN62APF, this arrived at Yarmouth a few days ago and is expected to head for Ipswich in due course. 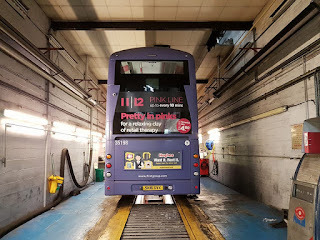 Enviro 300 67776 SN62AXU is now at Simon Morris for repaint into the new Park and Ride livery joining Norwich Volvo B7L 60916 YG02DKU which is to be repainted into Eastern Counties Red livery also worn by 32479 at Ipswich. Many thanks to David Warren for the Photos and to First for all the latest updates. This London Transport decker was noted outside the Border Bus premises at Moor Business Park in Beccles this morning. LX59CNA is a Scania OmniCity and was last with Stagecoach London where it wore fleet number 15137.The decker is on loan from Scania to monitor fuel economy. Today's PSV Notices and Proceedings Report for the East of England contains details of forthcoming changes to local bus routes. The main item of note is the cancellation of some of Ambassador Travel's school services from 22nd July 2017. They are three routes to the Cliff Park School in Gorleston - service 1 from Great Yarmouth, service 2 from Burgh Castle and service 3 from Belton. It is understood that First will be taking over the routes from the beginning of the new school year in September. Seems to be a lot of activity out there this morning with many short stay tourers in evidence and a First Eastern Counties decker on its first day in service! We will start first at Kings Road in Great Yarmouth where two coaches were hiding at the side of the Victoria Hotel. An impressive looking Scania Interlink Finesse AT17TTN from Birmingham based Attain Travel was trying its best to conceal Chapel End Coaches' B5CEC. A trawl of Marine Parade netted YN56FGJ, a Scania K114EB4 Irizar Century new to Lucketts of Fareham 4941 but now understood to be with Regal Busways. Meanwhile at the coach station two of the quintet on site were National Holidays' coaches - Setra NH13MWH with Tourismo NH15FCH bringing up the rear. Finally some business at Gorleston Post Office coincided with a glimpse of one of the former First Borders Geminis 37141 SN57HDA in use on the 8 to the James Paget Hospital following its repairs in Norwich yesterday. Also out this morning and in service was open topper W905VLN.